TB10 is reconsidering the biennial format through a number of structural proposals. A potential leitmotif is the question of what is distinctive of biennials today. What are the conditions of production a biennial creates, what can you do with a biennial that you cannot do with anything else. 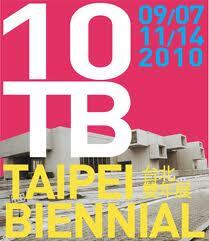 Avoiding the usual tabula rasa, TB10 will build on ideas and projects from previous Taipei Biennials. For example, a number of TB 2008 artists are invited to critically revisit their previous contributions. Artists first approached for TB10 were involved in a wider curatorial discussion. This resulted in a transfiguration of TB10 into a two year process, leading to a series of smaller exhibitions 2012. The process will be sustained by an academic framework that is currently being finalized, ideally resulting in sustainable art-pedagogical infrastructure. The show is deliberately restricted to 24 featured artists. Among the 38 artworks, nearly half are new commissions, many more are ambitious adaptations of older work. Much of the work is process-oriented, and a third is collaborative in some manner, with some 50 further artists being included via such collaborations. To engage with infrastructure and art production within the city, independent spaces have been invited to articulate various levels of collaboration. These resulting seven projects are neither parallel events nor curate contributions, but interfaces taking on wildly unpredictable flavors and criteria in each and every case.